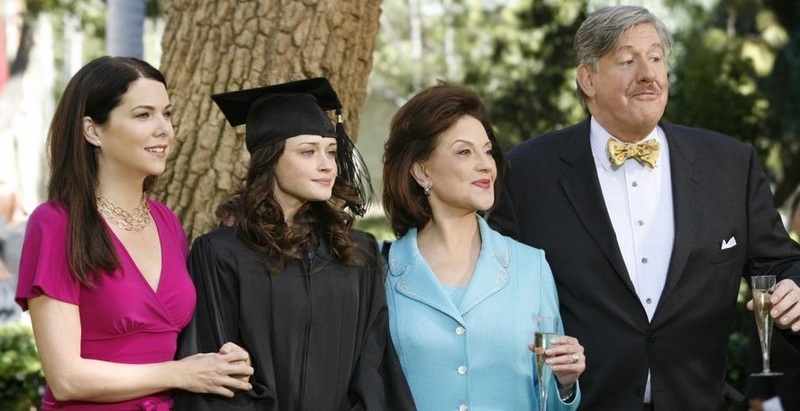 Although Season Six is my least favorite, Season Seven is the most controversial: with Amy Sherman-Palladino ousted as showrunner, the final year of Gilmore Girls is not quite like the other ones. I think it has good points and bad, but mostly I’m happy that—thanks to the Netflix revival—it’s not the end of the show. The detractions have some merit: Season Seven is Gilmore Girls on decaf. No episode indicates that more than “Farewell, My Pet,” in which Michel’s dog Chin-Chin dies, and Lorelai puts on a funeral. The gag—that Michel wants a beautiful ceremony, and no one wants to give it to him—goes on far too long. 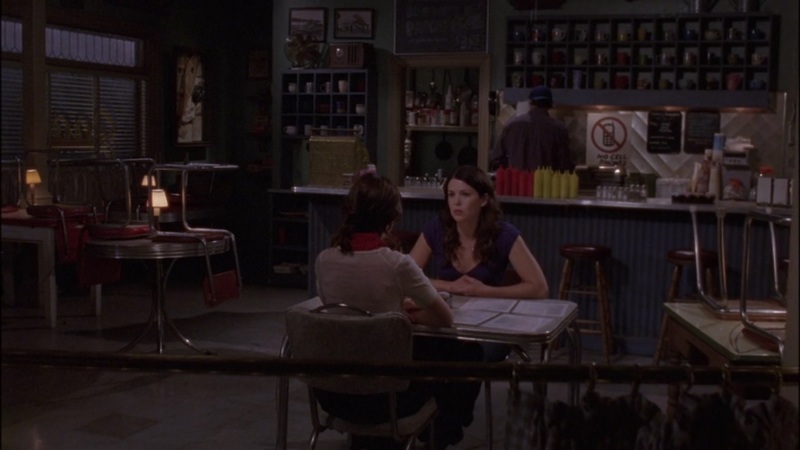 In seasons past, Gilmore Girls used wacky Stars Hollow events as backdrop. Season Seven brings them, unfortunately, into the spotlight. Some of the romantic relationships are equally controversial. Lorelai marries Christopher, which astonishes me. Rory sticks it out with Logan for far longer than I ever expected. And it takes a very, very, very long time for Luke and Lorelai to even start talking again. Despite all that, this season does develop something the show had been lacking: female friendships for Rory. She and Lane had been close, but the events of Season Six—not to mention their rapidly-diverging lives—seemed to have pushed them apart. And this season does marginalize Lane even more, making most of her plots about the perils of being in a loving marriage that nonetheless is modeled on the Donna Reed Show: Lane spends a lot of time being a wife and mom, and very little time being anything else. But Rory finally gets some new girlfriends! She’s always had Paris, of course, but Paris is more of a punchline than a lifeline when Rory’s in need. Her new Yale friends Lucy (Krysten Ritter) and Olivia (Michelle Ongkingco) are a nice reminder that college is when many young people make lifelong friends. That’s something else this show gets right: the fear of post-college life. At Chilton, Rory was all aflutter about whether or not she’d get into her dream college. Once she got in, she began to think through whether or not that was the right choice (hence the dark days of Season Six). And now, she has to figure out what her dream is, and what happens if achieving that dream requires a different road than the one she’d take. Those challenges are relatable, and Rory’s rejection from the New York Times was just the right amount of pain; her new job covering the Obama presidential campaign for an online newsmagazine is a beacon of hope. So is Lorelai’s eventual, slow reconciliation with Luke. I don’t think their relationship needed as many twists and turns as it wound up with, but I’m glad that they end the season in a stronger place than they started it in. • Saddest Moment: Lane realizing she can't go on tour with twin babies...but her husband can?! • Best Moment: Lorelai realizing that her mother’s desire to lend her money stems from love, and is just one big trick to get the Friday night dinners reinstated. • Worst Subplot: Three-way Tie: Emily Gilmore's DUI, Sookie getting pregnant because Jackson lied about getting a vasectomy, and Luke learning to swim. • Best Episode: "Bon Voyage"
I’m going to rate this 2.5 out of 4 Stars Hollows, mostly because I’m so excited for the reboot! OK, I have a problem. I like season seven way better than season 6 and can't understand why it's so unpopular! Apparently not everything will be followed up in the revival which worries me because the only storyline I didn't like was Lane's, and that's too big to undo. Ah well, I always like different bits to everyone else...! I just finished a rewatch and Josie, I think your comment about the seventh season being on decaf is exactly right. Rory's decision to say no to Logan took way too long and Logan successfully joining his father's world of super business in the first place never rang true. I expected him to decide that his father's world wasn't for him at all, but no -- he succumbed, and Rory seemed to be okay with that. Both decisions were out of character. At least Rory turning down his proposal made sense. Lorelei's marriage to Christopher worked for me to some extent since I had something of a similar relationship IRL. I can understand why Lorelei rebounded so drastically with him -- their relationship was always an unanswered question for her, and his romantic gesture in Paris would have been difficult for anyone to resist. It probably should have stayed an unanswered question, but sometimes we have to make these kinds of mistakes. One thing I really liked was what Luke did in the final episode: he went all out to create that town party for Rory, swearing Sookie to secrecy. It was a selfless, generous thing to do and typical of Luke, one of the things that made him such an appealing love interest, even with his eternal grumpiness and problems communicating and dealing with his feelings. I also liked the way he told Lorelei he still loved her so simply by once again wearing the stupid hat she gave him. I also liked how the show left Lorelei's difficult relationship with her mother Emily, another character that had difficulty communicating her feelings. Emily could never tell Lorelei "I love you so much; please come to dinner every week so that we can spend time together," and when Lorelei realized that this, after seven seasons, was what Emily was feeling, a barrier between them finally went down. Nicely done. So while the series finale was a bit unsatisfying, it still hit some important notes for me. Although I'm glad I now have rewatching "A Year in the Life" still to enjoy. A lovely review, Josie. Thank you.